There are many camps and clinics available throughout the year in our area. We try to keep current information posted about those camps as it becomes available to us. If you see something that is not current or we don't have listed, please email info@byhc.org and let us know so that we can stay up to date. Wolfe Hockey Development is having a Holiday Goalie Clinic December 27 and 28, 2017 at the Laurel Ice Den. The clinic includes 2 hours of ice time, a workout and a classroom session with one of the Wolfe Hockey Goalie Coaches each day. More Information and Register. Tomorrow's Ice will be hosting their new #HereWeAre Holiday Mini-Camp at Ice World from Tuesday, December 26 through Thursday, December 28, 2017. Register Here. Boe's Skills & 3 vs. 3 - Dates for 2018 are finalized! Our Hockey Director Boe Leslie and his Northern Roots staff will host their annual Spring Skills & 3 vs. 3 sessions on Wednesdays from March 7 - May 16, 2018 at Mt. Pleasant. More Information. MD Hockey Development - Coach Powell is hosting weekly sessions focused on technical skills and tactics Sunday Mornings at The Reisterstown Sportsplex March 19th - April 23rd. PeeWee/Squirt 9:00 - 10:00 AM. Midget/Bantam 10:15 - 11:15 AM. Exception - on April 15th sessions will start at 10:30 and 11:30. E-mail Mdhockeydevelopment@gmail.com or call Coach Brad 617-721-0699 for more information or download the brochure. Learn Develop Perform Clinic - The Stevenson University NCAA Men's Hockey team coaching staff will be hosting an 5 Week Skills Clinic on Tuesday nights at Reisterstown Sportsplex. April 3 - May 1 from 7:30 - 8:45pm for high school to junior aged players. For more information please email Coach Dawes or download the registration form. Mike Shramek of Tomorrow's Ice will field his spring hockey teams the Mid-Atlantic Selects again in 2018. Get registered for tryouts now. The season consists of around ten practices and teams participate in two tournaments in May and June. You can get more information by clicking here or on the Mid-Atlantic Selects link on the Tomorrow's Ice website. Please contact Joanna Nagle at joanna.nagle@byhc.org or Sean Baker sean.baker@byhc.org if you are interested in learning more about the program. Joanna and Sean can also be contacted for scheduling games. BYHC Hockey Director Boe Leslie will host his Northern Roots Baltimore Hockey School again this year at the Reisterstown Sportsplex from August 6 - 10, 2018. Click here for more information. The Washington Pride Girls Hockey Camp will run June 25 - 29 and August 20 - 24, 2018 at the Rockville Ice Arena! Open to girls age 9-18 and of all skill levels. To register or for more information, please go the Washington Pride website. Tomorrow's Ice will offer Super Skills again in 2019 and their now famous Game Changer Summer Camp Series. The camp series will consist of several weeks of age, gender and skill specific camps greatly expanding your training and development options. Registration is open now. 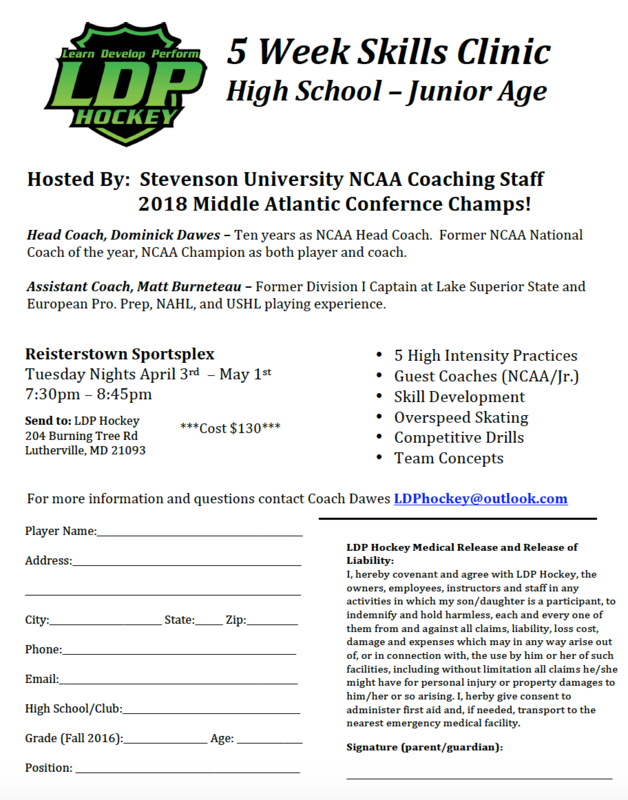 Learn Develop Perform Camps - The Stevenson University NCAA Men's Hockey team coaching staff will be hosting three day camps this summer at the Reisterstown Sportsplex. For more information please email Coach Dawes. Laura Stamm has been teaching her International Power Skating System since 1971 and will host a clinic at Mt. Pleasant July 13 - 15, 2018. This may be the best deal in town! There is also a clinic at the Gardens Ice House in Laurel July 16 - 19, 2018. Turcotte Hockey School will host its famous stick handling training at Gardens Ice House in Laurel this Summer from July 9 - 12, 2018. The Sport International Hockey Academy (SIHA) will be back again this Summer at Reisterstown Sportsplex from July 23 - 27, 2018. For more information go to SIHA's website.